UPDATE: Local Florida News channel WCTV Tallahassee covered today’s press conference and testimony before the Florida House and Senate where I spoke out against the bills increasing the pharmacy tech to Pharmacist ratio.To read the full story and watch the video news coverage on the WCTV website click here. On Tuesday April 2nd, I will be testifying before the Senate Health Policy Committee in Tallahassee to tell my daughter Emily’s tragic story and voice my strong opposition over SB818/HB671. If this ludicrous bill passes, it will increase the technician to pharmacist supervision ratio to six to one. If this happens, Florida residents will be put at a much greater risk of tragic medication errors similar to the one that heartbreakingly took Emily’s life. What really upsets me about this horrible piece of legislation, is that the ONLY people and organizations who ultimately benefit from this type of legislation passing, are the big retail pharmacy chains PROFITS, like Walgreen’s, etc. Their underlying motivation for lobbying so hard for these increased pharmacy technician to pharmacist ratios, is simply due to the fact that it costs substantially less for them to staff their profit generating pharmacies with as few salaried pharmacists as possible, having them supervising as many, hourly paid, pharmacy technicians as the law will allow. What’s most disturbing to me is the fact that these retail pharmacy chains are constantly putting their profits before their customer’s safety. In doing so, they treat their pharmacy technicians as unskilled, hourly labor. Putting them into a high volume based production line type environment, where there is a propensity for catastrophic human error that ultimately results in medication errors occurring. Evidence of this is that over the past six years, Florida has been the site of several very well publicized and tragic pharmacy technician related errors, which resulted in patient deaths and injuries. With all of this being said, I am appalled with the fact that the Florida State Pharmacy Board is actually supporting the passage of this ridiculous bill that will have tragic consequences for the residents of their state. Any state board of pharmacy’s primary mission is to protect the residents of their state from unsafe pharmacy practice. This raises an important question, do they really feel that by increasing the pharmacy technician to pharmacist ratio they are actually accomplishing their mission and adequately protecting their residents from this clearly unsafe pharmacy practice? Along those lines, I find it very hard to believe that Representative Travis Hutson (R), as well as, the members of the Florida Health & Human Services Committee who sponsored this horrible piece of legislation really DO NOT have their constituents best interest in mind. It really appears as though they are doing nothing more than lobbying for the retail pharmacy chains and their profits. I question why they have seem to have absolutely no compassion or empathy, at all, for the wellbeing and safety of the residents they all represent in the state of Florida. If they genuinely had the public’s safety in mind, and not the best interests of the retail pharmacy chains profits in mind, they might consider keeping pharmacy technician to pharmacist ratios where they currently are. Additionally, in my opinion, people like Representative Travis Hutson, would consider introducing legislation requiring retail pharmacy chains in the state of Florida to staff their pharmacies with more pharmacists, basing the number of required pharmacists on duty predicated on the volume of prescriptions being filled. 1) In 2011, California, New York, Florida, and Texas are the four leading states with the highest number of retail prescriptions filled. California has a 1:1 technician to pharmacist ratio, while New York and Texas have a 2:1 ratio. Florida is currently at 3:1. Currently, Indiana and Idaho are the only two states that allow a 6:1 ratio, with each state filling approximately 30% and 8% respectively, of Florida’s total number of prescriptions. The table below compares the ratios and volume done for each state. HB 671 allows increasing of the technician to pharmacist ratio, which will expand the workload on pharmacists with high volume stores, leading to an increased risk of medication errors and lack of patient safety. If this legislation passes, Florida would become the only high volume prescription state (third leading) with a highest pharmacy technician to pharmacist ratio. 2) According to a report done in 2008 by the Institute of Medicine, medical errors in the United States range from $37-$50 billion. Of that total, $17-$29 billion could have been a preventable adverse event. A systematic observational analysis of pharmacies in six large cities (Chicago, Los Angeles, Dallas-Fort Worth, Philadelphia, Seattle, and Tampa) revealed an error rate of 1.7% meaning four errors per day with a daily volume of 250 prescriptions. By approving HB 671, this will increase the number of prescriptions a pharmacist must check daily, thereby escalating the error rate and preventable costs associated with the adverse drug event. 3) Studies done at Auburn University and Texas Tech documented that the risk of error rises along with the number of prescriptions filled per hour. These studies showed that pharmacist’s error rate is volume dependent. Pharmacists who are pushed beyond the limits also have less time to properly consult their patients. Consultation has been shown to decrease the risk of the patient leaving with the incorrect drug by 88%. .
Studies show that medication errors occur on a daily basis in the State of Florida and other states. HB 671 and SB 818 do not provide any benefit to the state or local governments in Florida. Both bills do nothing for the citizens or patients in the State of Florida except require that the pharmacist check the work of twice as many pharmacy technicians as before. This would cause greater medication errors affecting patient safety and lead to greater morbidity and mortality. So who does HB 671 and SB 818 benefit? Why would any legislator sponsor such bills? Unfortunately, it seems to benefit only the special interests and large chain pharmacies in Florida to increase their profits and bottom line. What does it do for the citizens in Florida? It creates a less safe environment to get their prescriptions filled and increases the risk of more medication errors. The profession of pharmacy is often times referred to as the most trusted profession. This is because the public sees that the pharmacist is accessible, strives to provide the best care at the most responsible cost. The pharmacists of Florida are most concerned about this bill. Pharmacists have said in surveys that they will not be able to provide the care they were trained to do and the public expects of them safely. Therefore, SB 818 is bad health care policy and should definitely be defeated! 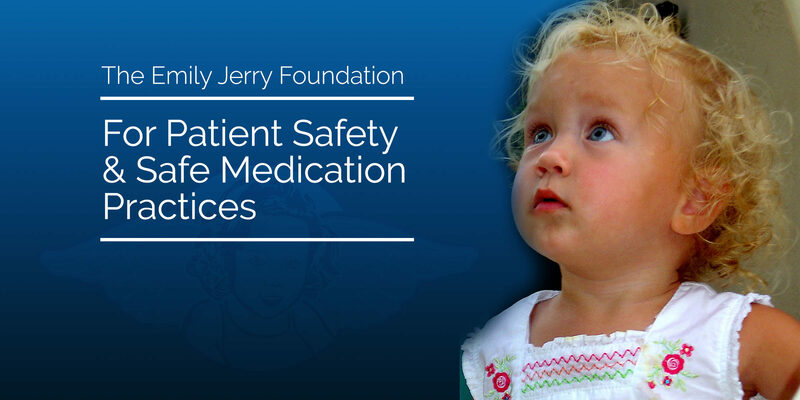 We are excited to announce that a story on the Emily Jerry Foundation is featured in the Patient Safety awareness campaign publication distributed by Media Planet as an insert in the USA Today. The publication hit newsstands last Friday morning. Please remind your friends, family, customers, and colleagues in the New York, Washington D.C./Baltimore, Chicago, and San Francisco areas to pick up their copy of USA Today! The report can be found directly in the center fold. Through USA Today, targeted events and conferences, and online/social media outlets (Facebook, Twitter, blog and website postings) the publication will reach more than 3 million readers, empowering them to take action, control of their health, and join our shared cause. As you’ll notice, Friend of EJF, Flight Captain and American Hero Sully Sullenberger graces the cover of this great insert. We are incredibly proud to be associated with such a man. Hopefully one day the Emily Jerry Foundation will have saved countless lives through our daily work, just as Sully did that fateful morning. We salute him and patient safety advocates everywhere! We had the opportunity to attend the premier of the Discovery Channel documentary “Surfing the Healthcare Tsunami; Bring Your Best Board” on Friday April 27th in Washington DC at the National Press Club. 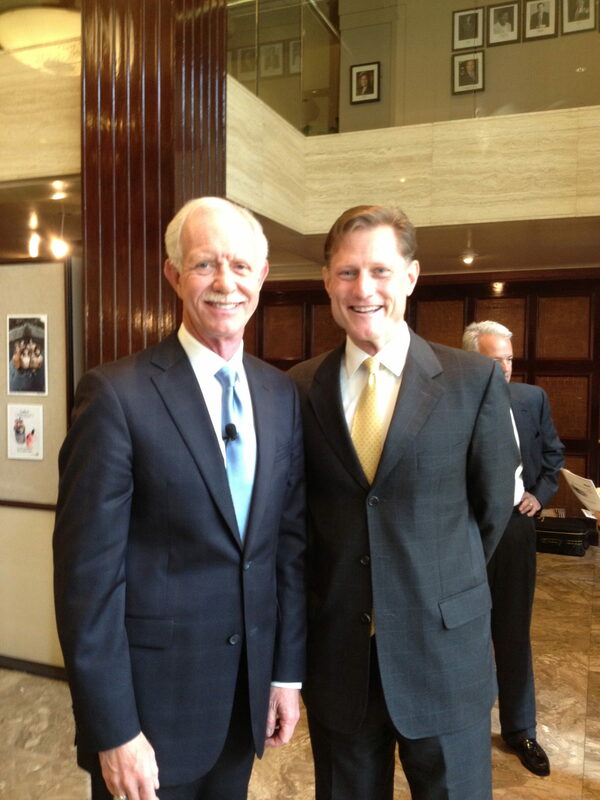 While there I met Sully Sullenberger who incredibly landed US Airways Flight 1549, which had been disabled by striking a flock of Canadian geese during their initial climb out, in the Hudson River off Manhattan, New York City, on January 15, 2009. All of the 155 passengers and crew aboard the aircraft survived. Sully is not only a great guy in my opinion, he’s a true American Hero! This patient safety documentary features the initial interview I did last year with Eric Cropp, where I publicly forgave him for what happened with Emily. I have always felt very strongly about the fact that when these horrible tragedies occur in medicine, that the real focus should always be on “where did the system break down?’ and not on any one individual who clearly had no malice. In looking at things from this perspective, I truly believe that we can learn from these horrible events and implement measures and safeguards to prevent these same medical errors from occurring over and over again. On March 1st 2006, my beautiful daughter, Emily, tragically died from a medication error during what was supposed to be her final round of chemotherapy. What makes Emily’s story even more heartbreaking is the simple fact that Emily had a very large yolk sack tumor in her abdomen that had completely disappeared after five short months of chemotherapy. The only reason she was receiving a final round of chemo was to make certain that there were no residual cancer cells remaining in her body that could cause her problems later in life. After her tragic death, it was determined that the error that took Emily’s life was a direct result of an IV compounding mistake that had been made in the hospital pharmacy. Like most medical errors Emily’s death was really a direct result of “human error” that had occurred on the part of the pharmacy technician preparing Emily’s IV medication that day. Shortly after establishing The Emily Jerry Foundation, I began focusing my advocacy efforts on trying to find solutions that would save lives through the “smart” implementation of technology to reduce this “human error” component that is all too prevalent in medicine. With that thought in mind I am very pleased to announce that one of our key patient safety technology partners, Codonics, with their Safe Label System, and The Emily Jerry Foundation are on a “Mission of Safety” during National Patient Safety Week this week. Please see our important press release located below.